Karnataka Institute Of Cricket ( KIOC ) will be conducting the 22nd Summer Cricket Camp for boys and girls at KIOC new campus in Bangalore. the camp starts on April 1St and ends on May 15. 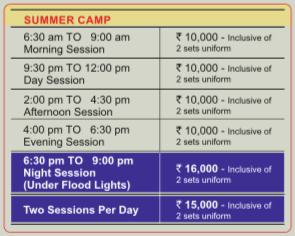 There will be Five sessions per day including a session under lights. John Brierley, Ross Edwards & Charles from England ( All level Three Coaches) And Andrew Walton from Australia will be our foreign coaches contracted to help our cricketers in their quest to be the best they can be.